Unlike other business people, solopreneurs must do everything alone. Every business role requires your attention—from project management and accounting, to marketing and customer service. Though it takes a lot of time and effort to keep such business afloat, the hard work eventually pays off. If you are brave enough to become a solopreneur, congratulations. While such an endeavor is difficult, with the right tools and the right mindset, it is far from impossible. There will be difficulties, that’s for sure. And as you probably know, one of the things you probably struggle with is how to engage your target audience. Sure, you might know who they are, but you aren’t quite sure what do in order to attract them and keep them interested in your offer. Read on and find out five effective tips to help you do just that. Today, business success without a strong social media presence is virtually impossible. Social media sites allow you not only to promote your company but also to reach your target audience. In order to do the latter, you first need to find out where people in your target market spend their time. For example, some people prefer the short format of Twitter, while others stick to more visual platforms like Pinterest and Instagram. Certain groups may be found on LinkedIn, while some prefer the universal allure of Facebook. The important thing is to choose the right platform so you can reach the people who will most likely become your customers. Once you’ve chosen your platform, create a profile that accurately describes your potential. While doing that, make sure you don’t miss any important information—include your business name and logo, describe what you do in the “about” section, provide a link to your website and your contact data, and so on. This is your chance to make a great first impression, so make it count! The solopreneur Kelly Lester founded EasyLunchboxes and gained huge popularity thanks to her interesting website and an active social media presence. The above screenshot is the “about” section on her Facebook page. If you look at it closely, you will see how it contains all the necessary information that conveys a professional image of her company. And now comes the most important part—connect with people. As a solopreneur, you won’t have that many customers, so you have a chance to connect with everyone who follows your social media pages. Engage in conversations as much as your time and obligations permit. Participate in the community by liking and sharing the content that others post. Build relationships and discuss issues related to your industry that make your startup the best partner in solving problems. The more you participate and make yourself accessible, the more you engage your audience—it is a simple as that. As we’ve just discussed, you need to create a compelling social media presence that keeps visitors coming back. One way of doing so is by organizing contests and giveaways. People get excited about free stuff, so try holding giveaways and contests that encourage two-way communication and community engagement. For example, you could offer a special reward to the person who writes the best Facebook review about your product or service. If you have a traditional store, you can host events there to promote the awareness of your brand. You can also give out exclusive coupons and advertise discounts for select products or on special days. When you already have an existing base of customers and supporters, find ways to reward them for their loyalty. 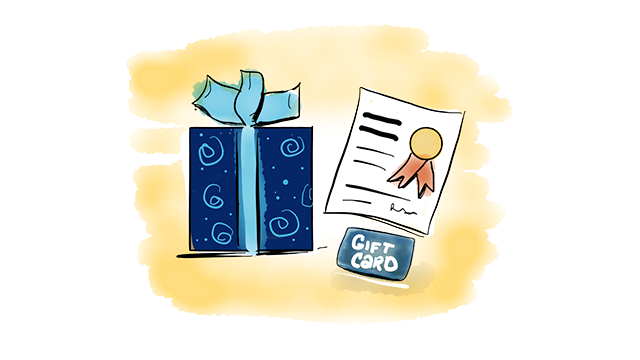 Small tokens of appreciation such as a thank you note goes a long way to reinforce the attractiveness of your brand. 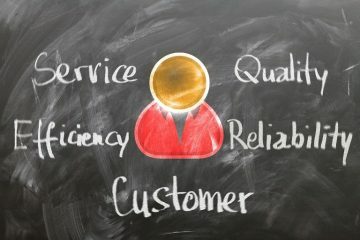 Always try to find ways to deliver personalized service to every one of your customers. Rather than focusing on the products or services your company provides, try delivering content that offers solutions to the problems your customers face. For example, articles that feature tips and tricks help people get better results from their projects. Add visual content including images and videos to stimulate interaction and to communicate your message in new ways. Jokes and memes also help capture your audience’s attention. 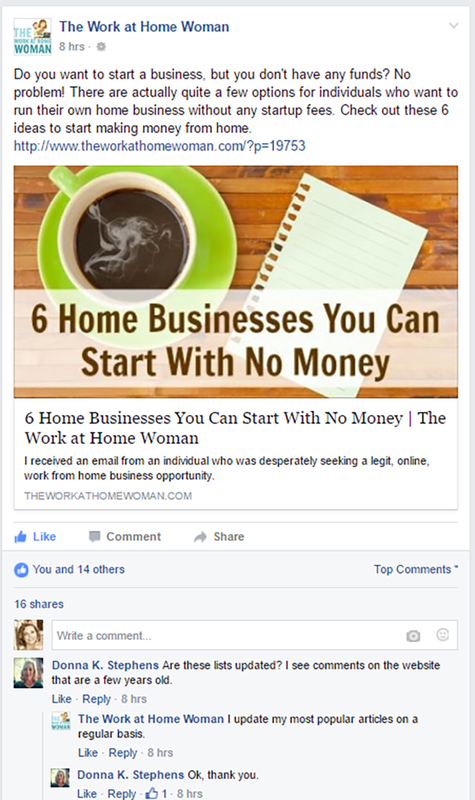 You can post this content on your website and then promote it on social media. Encourage users to generate content as a way of engaging your audience and providing them with a variety of perspectives. Engaged readers share your content with others, spreading awareness of your brand and promoting your products. Holly Hanna of The Work at Home Woman provides an outstanding example of a solopreneur that gives her audience amazing stuff. She has built a successful business by providing her audience with fun and informative content, so it’s no wonder she has over 18,000 followers on Twitter and more than 25,000 likes on Facebook. Not only did she provide her audience with an informative article, she also made the effort to respond promptly to a visitor’s question. This is definitely something you should consider doing. As you are already well aware, your customers are your most valuable asset. If they have a positive experience with your company, they will probably spread the word and become free advocates of your brand. However, if they are displeased, they will bad mouth your company and harm your reputation. Because of that, it is imperative you invest time and energy into providing excellent customer service and keep them satisfied at all times. So, what can you do? Well, you can use social media to always be there for them. When they make inquires, make sure to respond as fast as you can. If they leave complaints, apologize and solve the problem. You can also go a step further and thank them for their positive comments. Although such behavior should be your priority on all channels (in person, telephone, email…), social media gives you a great chance to show everyone how much you value each and every customer. Owning your own business also implies having to communicate with other people—you are a solopreneur, and no one else will do it for you. Whether you communicate face-to-face, over the phone or online, it is important to avoid too much formality. Instead, try to adopt a friendly, congenial tone that builds close relationships. Be fun and humorous, and people will like you. You should also try some unconventional approaches to get publicity. For example, you can use street art to promote your business—place distinctive shapes and drawings in front your store or office and see what happens. Furthermore, rather than having conventional business cards and promotional materials, you can create a humorous list of the top 10 reasons why people should choose your firm. The possibilities are quite endless and it’s entirely up to you to explore different options. As a solopreneur who singlehandedly builds and operates a business, you will face many challenges. But engaging your target audience should be a little easier if you follow the above tips. Although it might seem overwhelming, it is always wise to invest time and effort to please people. By applying these five effective tips step by step, you will engage your audience, build brand awareness, and make your business stand out. So try not be discouraged by the amount of work you have to do because it will ultimately pay off multiple times. Over to you. What do you do to engage your audience? Or have you struggled to get any engagement and have questions? Let us know in the comments below. 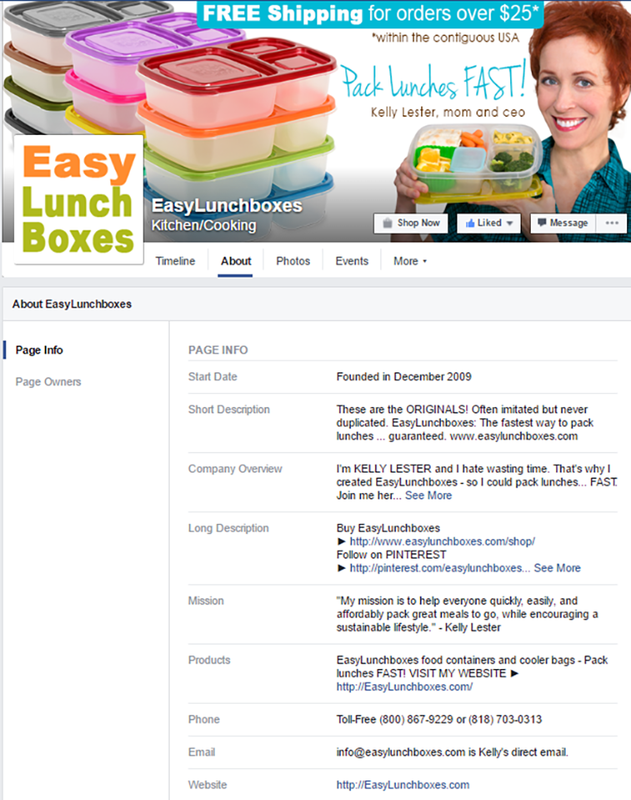 Whoa – love EasyLunchBoxes’ About page! What a great visual example! I need to learn from that! Wow! Natalie, this is quite insightful. If you can keep the communication and interaction going, the relationship will wax stronger. More so, you can use, quote or reference their contributions, opinions, questions and comments in subsequent post. That makes them feel important and belong, so they can engage more. Thanks for the insightful and wonderful post. Wax stronger. That is a great image to hold especially because in my early years I was a custom car painter so it was always a pleasure to Wax On! But that’s a different script. I’m so glad that you included “be fun and engaging”. I am learning more and more that it is a really GOOD thing to show off your personality in emails and posts to your audience. Great stuff! Thanks for your comment Lizzie! The fun part of it all really matters because nobody likes to communicate with an overly formal person 🙂 Give people some entertainment along the way, they love it! Easy-Peasy? Great headline and thank you for a 1st sentence that really resonates with me. Today I will review more than a few times. 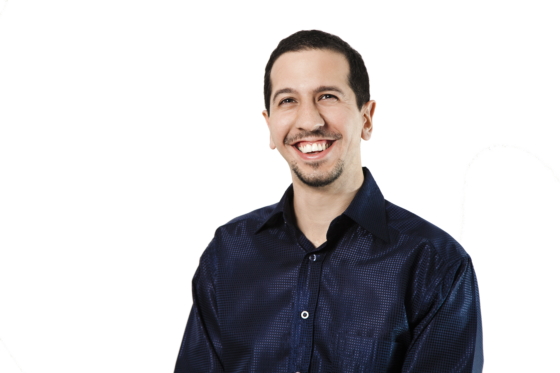 Enticing readers and social media followers to engage is difficult for many solopreneurs. You’re smart to suggest beginning on social media. It’s a great way to practice for your email readers, while learning ways to engage with them. Contests and give-always are fabulous for rewarding our audience for their engagement. Another option for offering engaging content is to describe simple steps for solving a common problem your audience has. Thanks for sharing the Facebook examples of engaging content! These 5 keys are really very effective for audience engagement. Now-a-days it is truth, without strong relationship in social media almost not possible to get success in business. Social media plays crucial role in encouraging your firm and also helpful to target audience. Today rather than writing articles, photo and videos are very helpful to establish interaction and massage communication in latest way and these are highly effective to gain popularity and promotion of firms. These incredible five tips are really work for promotion of firm. Today social media is all in all for promotion of company although people are adopting this tricks due to effective in nature.